"Why Doctors & Healthcare Firms Should Own A Mobile Application"
"5 Ways To Enhance Holiday Online Sales"
For those who are planning to bring their business into the online world, there is bound to have doubts in mind regarding which ecommerce platform to choose from a wide variety of options out there. Selecting the ecommerce platform to build your online business is one of the crucial aspect of building your business online. 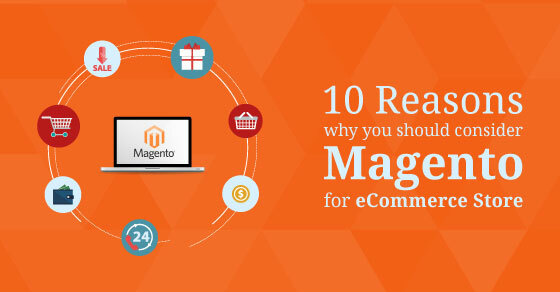 As an answer to the million dollar question we suggest trying out magento ecommerce platform. If you ask why then it’s one of the leading ecommerce platforms out there in the market. Apart from being open source & completely free, here are ten reasons why you should consider it for building your online business empire. Site Management: Magento provides a functioning interface which make possible a well-organized management of multiple web channels and stores from one Administration Panel with the ability to share as much or as little information as needed. This site management offers maintenance administration permission system roles and language localization with numerous currencies,Google website optimizer, CMS for informational pages,integration for A/Band multivariate testing. Mobile Commerce: Magento offers M-commerce or mobile commerce aspects With the integration of the HTML 5. Shoppers can view mobile-optimized versions of their website which provides either full site catalog or a compatible view of products customized for mobile customers. This gives a brilliant opportunity to increase the businesses and the shoppers are also benefited as they can easily purchase things from anywhere through their mobile phones. Catalog Management: Magento let you to add countless products to your online catalog and even process hundreds of orders without interrupting the site’s functionality and performance. To further make your life easy this section of the magento admin side lets you easily add new products, edit the product information like product images, description, SKU etc and create, manage product attributes & tags from one central location. Search Engine Optimization: Magento is one of the SEO friendly ecommerce platform right out the box. These comes equipped with great, unique features comprise adding auto generated popular searches and modifying, creating Google sitemaps, full control on URLs to make them according to SEO and Meta information for all web pages which make it easier for search engines to sift through all your content. Magento Catalog Price Rules: Magento provide an automated catalogue price management feature which can be defined by a set of conditions set by admins in the store admin panel. This feature allows the store administrators to easily create offer prices for a set of products or individual product & have them revert back to the original price on a specific date from the admin panel itself without having to dip their fingers in the backend codes. Order Management: Magento order management feature allows you to keep your customer at the center of your operations at all times by providing data from each touchpoint, orchestrating and optimizing based on rules and processes. In this feature you will also get one view of your orders and inventory, plus intelligent sourcing logic, which enables you to route orders for fulfillment from the best location (warehouse, store network, drop-shippers, etc.) based on a set of prioritized rules you define. Analytics and Reporting: Magento extends an auto association with Google Analytics, Google Base and Google Checkout which offers countless report options such as sales reports, tax reports, tag reports, coupon usage reports, RSS feeds for new orders, search terms reports, best viewed products reports, and best purchased products reports. These reports can help you to optimize further and keep track of your store performance. Also they help to analyse the results of the A/B and multivariate testing activities. Checkout: The checkout features of Magento take up shipping to multiple addresses in one-page checkout, get gift messages per order and per item, SSL security for orders on both the front-end and back-end, checkout with account to use address book and checkout without an account/guest checkout. Saved shopping cart with tax, shipping estimates and saved credit card method for offline payments. Outlined to authorize and charge, or authorize only and charge on creation of invoices and integration with multiple PayPal gateways. Shipping: Magento provides hordes of shipping alternatives such as shipping to multiple addresses in one order, multiple shipments per order, free shipping, table rates for destination and weight, and rates for multiple numbers of items and destinations and table rates for product sub-totals and destination.Shipping integration with label printing and real-time shipping rates from: - UPS, FedEx (account rates),USPS, UPS XML (account rates), and DHL with an on-site order tracking from customer. Customer Service: Magento ecommerce enhances customer satisfaction with its self-service and backend tools aspects such as feature-rich customer accounts, order tracking from accounts, order history with status updates and auto update emails for your customers. Further store admins can create, edit orders and customizable transactional emails from the admin panel. If you're looking to start or upgrade your ecommerce store, talk to our expert magento development team today!